Welcome to our Airport Hotel in Austin, TX. Allow this unique city to show you what it means to, Keep Austin Weird, as its motto insists. Seemingly misplaced in the land of honky tonk, this art influenced, distinctly different city boasts the title of "Live Music Capital of the World." Whether you are in town for business or leisure, the all suite Holiday Inn Express & Suites Austin Airport hotel offers a welcoming and comfortable atmosphere to call home during your stay. Circuit of the Americas is a world renown 3.4-mile motor racing circuit near Austin, Texas. It hosts many high caliber racing events such as the Formula One United States Grand Prix, Moto GP, American LeMans Series Race, etc. The Austin Convention Center, in Downtown Austin, is the host of many large events & conferences year round. 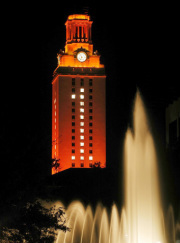 The University of Texas Campus is located near Downtown Austin, just minutes away.